Congratulations to Town on beating Bournemouth the other night; a great day for the club. So it seems like a good time to look back to 30th September 2006 when Huw was at the Town vs Bournemouth match which ended in a 2-2 draw. Huw was 10 years old and in his last year at Upperthong Junior School. Town, being a great community club, had provided cut price tickets to the junior schools for this match. Huw and I used to go 4 or 5 times a season – usually with Nige and Will Bowers, Russ and Sam Briggs, Al and Joel Birkhead. We loved the football but Huw’s highlights of the trip also included the obligatory hot dog and lots of messing about on the 20 minute walk to the stadium. 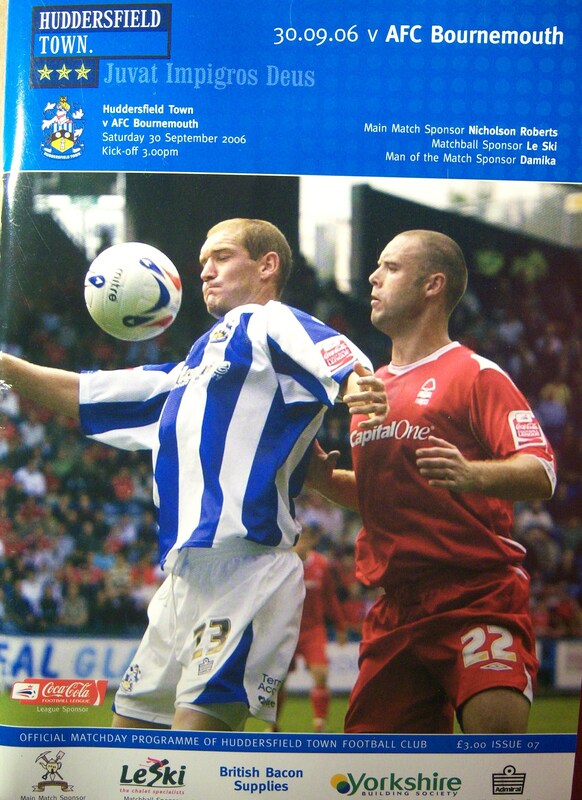 On that day in 2006 Gary Taylor Fletcher (now playing with Blackpool in the Prem) and Luke Beckett got the Town goals. Peter Jackson was the Town Manager; Peter attended at the celebration of Huw’s life on 25th March 2011 in his current role as Manager of Bradford. We now have a signed Bradford shirt with Peter’s signature and sending his love and thoughts to Huw. Terry Yorath was Town’s assistant manager in 2006. Bournemouth included Leon Best (now at Newcastle), Darren Anderton (former England international) and Eddie Howe (now manager at Burnley) in their line up. Town talent on show that day included Boothy (in his second spell with the club) and Nathan Clarke. Around 4 years later (last summer) Huw was to receive the player of the year award for his age group at Hepworth and was presented the award by Nathan Clarke! Huw is pictured here receiving the award and nursing an ankle injury he had picked up that morning. Huw well deserved the player of the year award in 2009-10 and it is an award I will treasure for ever. Huw worked hard that summer in 2010 to build the strength back up in his ankle and was fit and raring to go for the start of the season in September 2010. Alan Young was terrific in treating Huw’s injury and Paul Stephenson gave us great advice on the day he injured it. We were given this signed Town shirt when Huw passed away by a friend of Huw’s – I intend to get it framed and will treasure this also. 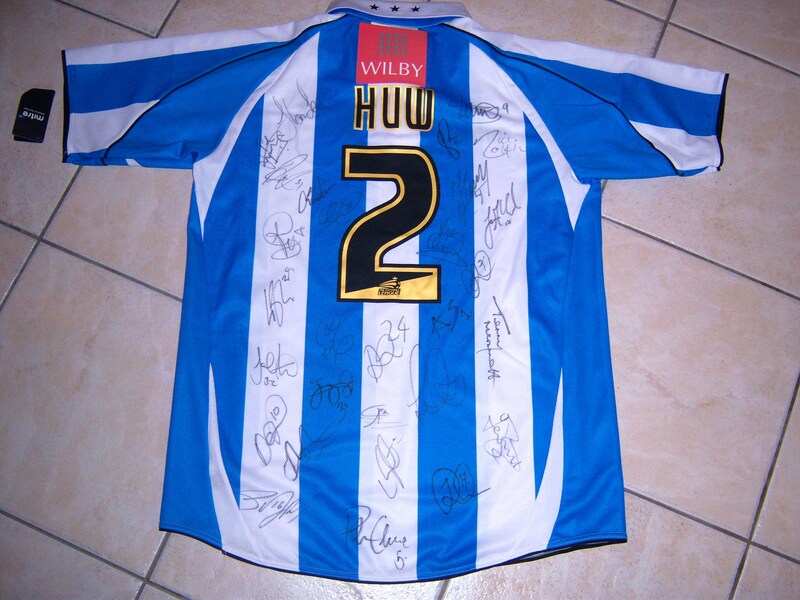 The signature of Nathan’s brother (Peter) who also plays for Town can be clearly seen in the middle at the bottom of this signed shirt. Happy days at Town 4 or 5 years ago for me and Huw. Town are doing great these days and I’ll be shouting for them in the play off final, but I’ll always have memories of taking Huw to Town in years gone by. In years to come (hopefully next season) Town will play Cardiff. Seeing that fixture will be a moving moment, and for once I won’t be bothered who wins – the occassion will say it all.